Spain-bound: The lucky ISA Training apprentices will be working in salons in Tarragona, Catalonia. Nine hair and beauty apprentices are heading for some special work experience – in Spain. The group of hairdressing, barbering and beauty apprentices are heading for Spain (March 17 – April 1) as part of their apprenticeship with Welsh training provider, ISA Training. 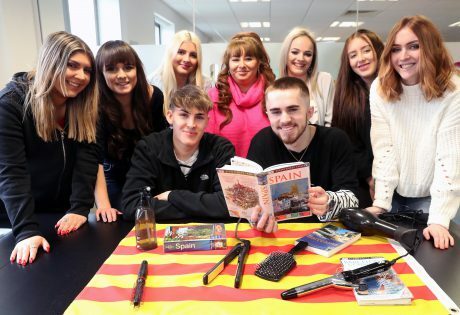 They will spend two weeks working in salons in Tarragona in Catalonia learning a variety of hair and beauty skills. The work experience placement scheme has been organised by ISA Training and L’Institut Cal·lípolis – the host organisation for the visit – and with funding support from the European Union’s Erasmus+ programme for education, training, youth and sport. The lucky apprentices are: Athena Yiacoumi (Lazarou Brothers, Cardiff), Adam Robst (The Barbershop, Cardiff), Francesca Sterry (Revival H&B, Lydney), Romie Bow (New Look Beauty Care, Abergavenny), Chloe Morris (The Beauty Box, Merthyr Tydfil), Ceara Clark (KLM Barbers, Caldicot), Chloe Woodward (Reds, Stroud), as well as Rosie Walters and Tyler Williams who are both from Lara Johnson Lifestyle in Mumbles, Swansea. ISA Training has established strong links with many salons in Spain, says mobility trip’s leader, and ISA partnership manager Cheryl Pearcey. Who will be leading the group along with accompanying staff Lisa Lee, internal quality assurer, and apprenticeship practitioner, Emily George. Says Cheryl, “This will be our fourth mobility trip to Spain, we’ve got some well-established work placements, and also some new salons too and we’re excited to be working with the new Spanish salons. “The learners will be working seven, or eight, hour days Tuesday to Saturday, as they would at home. On their free days, we have arranged visits and activities as this programme is also about broadening their horizons and giving them the confidence to travel. In preparation for their Spanish work experience, ISA Training has been running language and culture workshops as well as taking them through the process of completing the required European documentation. Bridgend-based ISA Training is the largest independent hair and beauty training provider in Wales. Delivering government-funded programmes in Hairdressing and Beauty, ISA Training works with over 700 learners and 450 employers. The Spanish visit has been arranged as part of ISA Training’s Oyster Project, which is based on the saying ‘The world is your oyster’. The project aims to enhance the learning experience of apprentices, increase their confidence and broaden their horizons. ISA Training’s learners have benefited from work experience in a number of countries including Spain, Cyprus, Poland, Turkey, the USA, and most recently Finland and Germany.